If you want to get your business involved in your local community, what better way to do it than to make donations to local campaigns? Not only can this improve the condition of your neighbourhood, thus increasing your chances of attracting business, but it can raise your company profile at the same time. There are all sorts of ways you can make donations. Doing so will increase the loyalty which local people feel towards you and you will be setting a good example for individuals. By contributing to projects like this, a business can become a driving force in the community. The first thing you need to do in any kind of community involvement is to pay attention to what's going on around you. Read the local newspapers, make time for the local television and radio news, and read community notice boards. Talk to your customers. Think about the issues which arise and whether or not there are situations in which you might be able to help. Is anybody making an appeal for donations? Are people complaining about the same local problems? Are there community institutions threatened with closure due to lack of money? Obviously you can't make donations to every campaign which comes along. However it can be difficult to reject emotive cases as they arise. It's a good idea to set aside a fixed budget for donations before you consider any cases individually, making sure that you're limiting yourself to a quantity of money your company can afford to spare. There's no point in making such generous donations that you put your business at risk - that way you'll be unable to help anyone (including yourself) in the future. Make sure you research cases carefully before you get involved. Sadly, there are people out there who solicit donations illegitimately. If you're following up something you've heard about through the news, try to talk to the journalist who broke the story. This is a good way to make sure you're safe and it can help you to raise your profile and get publicity for your donations as well. There are all sorts of different ways to make donations, and which you choose should depend largely on what you want to get out of it. 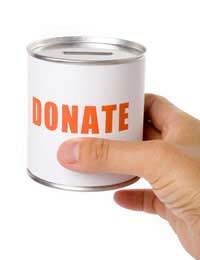 A big single donation is a good way of making headlines and drawing a lot of attention to your business in one go. It can really boost morale for campaign workers but there's also a danger that, after it has been made, other people will think there's no longer any need for them to make donations. A good alternative to this, though it may not get you such spectacular publicity, is to offer to match other people's donations with your own, up to a certain limit. This means that for every pound a member of the public donates, you donate a pound too. This kind of scheme empowers the public and makes them feel excited about combining their resources to reach the target you've set. Some businesses prefer to develop ongoing relationships with particular campaigns, making regular donations over a period of time. This can be a good way to guarantee that funds will keep flowing in situations where campaigners need to exert ongoing pressure, such as where funding is required for a series of repairs to neighbourhood facilities. Again, it won't maximise potential publicity, but it can keep your profile in the public eye over a long period of time and it will inspire real loyalty among the individuals involved in the campaign. Finally, don't forget that money is not the only thing you can donate. Your business expertise can be of enormous value to campaigners and you may have particular skills and facilities which you can usefully place at their disposal. Why not provide free photocopying, poster design or snacks for tired door-steppers? If you own comfortable premises such as a café or studio, why not let meetings be held there after hours? A little effort and imagination on your part can go a long way. Becoming a campaign donor can be emotionally as well as economically rewarding and it's a great way to give something back to your local community in return for everything it's given you.